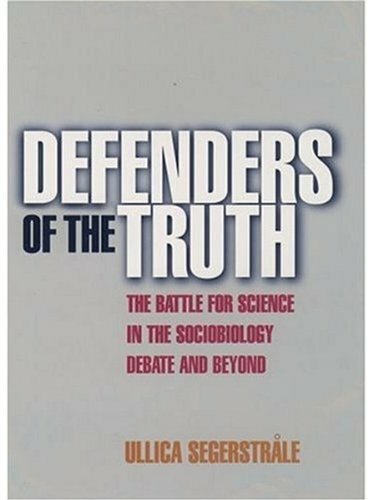 For the last twenty-five years, sociobiologists have come under continuous attack by a group of left-wing academics, who have accused the former of dubious and politically dangerous science. Many have taken the critics' charges at face value. But have the critics been right? And what are their own motivations? This book strives to set the record straight. It shows that the criticism has typically been unfair. Still, it cannot be dismissed as 'purely politically motivated'. It turns out that the critics and the sociobiologists live in different worlds of taken-for-granted scientific and moral convictions. The conflict over sociobiology is best interpreted as a drawn-out battle about the nature of 'good science' and the social responsibility of the scientist, while it touches on such grand themes as the unity of knowledge, the nature of man, and free will and determinism. The author has stepped right into the hornet's nest of claims and counterclaims, moral concerns, metaphysical beliefs, political convictions, strawmen, red herrings, and gossip, gossip, gossip. She listens to the protagonists - but also to their colleagues. She checks with 'arbiters'. She plays the devil's advocate. And everyone is eager to tell her the truth - as they see it. The picture that emerges is a different one from the standard view of the sociobiology debate as a politically motivated nature-nurture conflict. Instead, we are confronted with a world of scientific and moral long-term agendas, for which the sociobiology debate became a useful vehicle. Behind the often nasty attacks, however, were shared Enlightenment concerns for universal truth, morality and justice. The protagonists were all defenders of the truth - it was just that everyone's truth was different. Defenders of the Truth provides a fascinating insight into the world of science. It follows the sociobiology controversy as it erupted at Harvard in 1975 until today, both in the US and the UK. But the story goes more deeply, for instance in its account of the circumstances surrounding W.D. Hamilton's famous 1964 paper on inclusive fitness, and on the connections of the sociobiology debate to the Human Genome project and the Science Wars. General readers and academics alike will find much to savour in this book.